The tropical ylang ylang tree produces flowers in a star shape, which are commonly used in aromatherapy and perfumery. 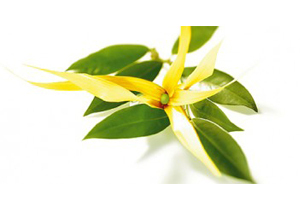 Like jasmine, ylang ylang possesses aphrodisiac properties, making it of popular use in marriage ceremonies. The scent eases stress and tension, while promoting optimism, and is also a common ingredient in hair and skin products due to its aroma and its nourishing properties. The strong aroma requires only a couple drops when diffused, and ylang ylang complements citrus scents, like grapefruit and bergamot, as well as vetiver and geranium. Ease relaxation by dispersing ylang ylang with Epsom salt in your bath water. Reenergize your skin with an aromatic ylang ylang steam facial. For a floral perfume, apply to your wrists. To reduce skin sensitivity, dilute Ylang ylang essential oil with Fractionated Coconut Oil. Ylang ylang essential oil should be kept out of reach of small children. If receiving medical attention or are pregnant or breastfeeding, always consult with your physician before using essential oils. If you have sensitive skin, dilute heavily. Sensitive areas, ears, and eyes should be avoided when using this oil.